Simple, divine and earthy are the trademarks of this Sweet Aval. Even though there are only four ingredients Poha, jaggery, coconut and cardamom, people prepare this in hundred different ways. Some heat the jaggery and coconut while others do not, some do not wet the poha, and some do not mix coconut jaggery together .. you get the idea. I pretty much follow my mom’s recipe. 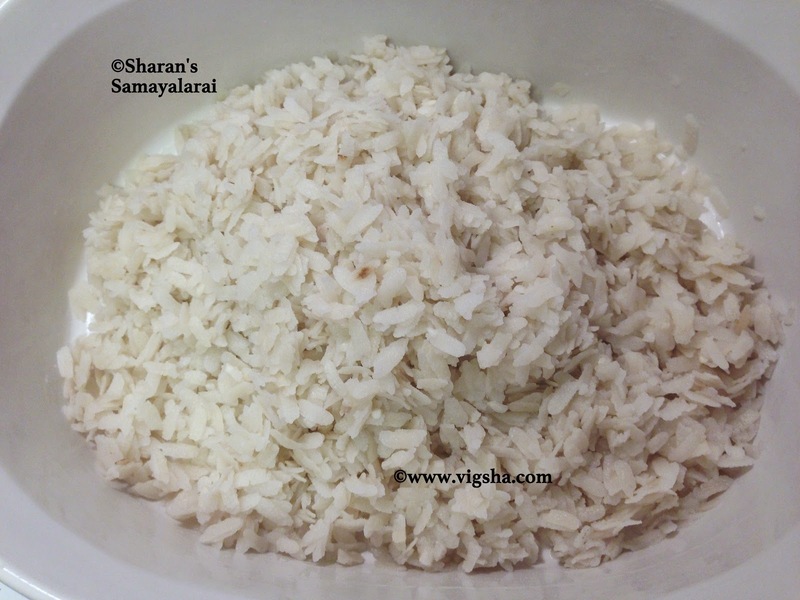 Aval (Tamil) is called Atukulu in Telugu, Poha in Hindi, Avalakki in Kannada and Flattened rice (also called beaten rice) in English. It is extremely filling as it is laced with cashews and golden raisins. It is my husband’s favourite snack ! 1). 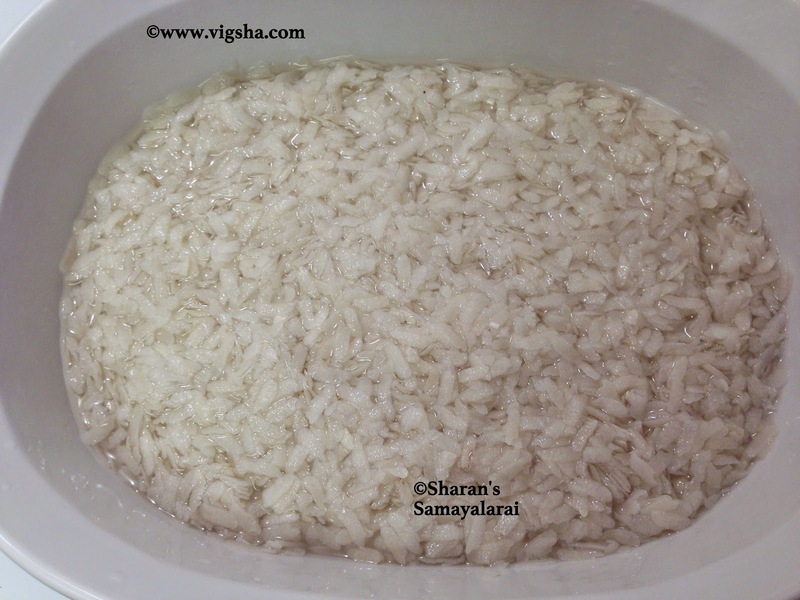 Soak Aval for about 3minutes and let it drain the excess water by keeping it in strainer for 10 min. They turn in to a very soft and puffed rice. They should be used immediately else they become hard and the process continues once again soaking them in water. Take care to not make it very soggy. 2). In a pan heat 2 tbsp of ghee, add the cashews fry until light brown and then add the raisins until it plumps. Keep it aside. Mash the banana and keep aside. Powder the jaggery without any lumps. 3). In a wide Mixing bowl, add powdered jaggery, mashed banana and cardamom powder. Combine them together without any lumps. 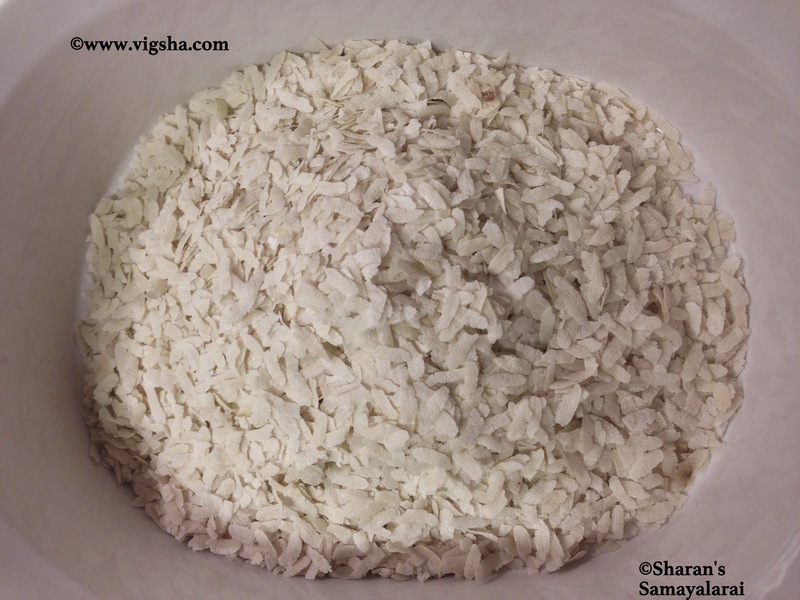 Then add soaked aval, grated coconut and mix. Finally add ghee roasted nuts along with the ghee, combine ! Done ! Serve immediately or use as filling in dosas. # Fresh coconut suits best for this recipe, as it has its own juice. The frozen ones are dry and do not have moisture, still u can use it. # Do not substitute coconut with coconut powder or coconut milk. 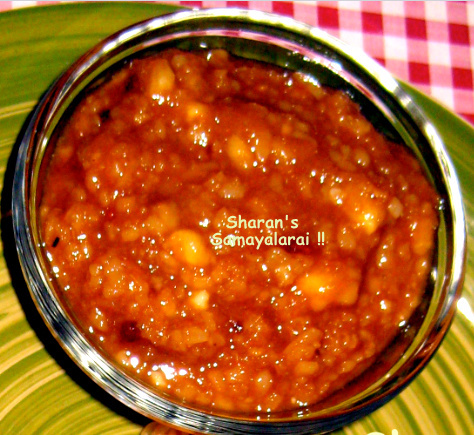 # Make sure the jaggery is fully powdered and there are no lumps in it. # Bananas taste absolutely fantastic with the fare, but you can skip it if you don't like, even without it, it would be extremely filling. # You can use any nuts of your choice, it enhances the taste. I sometimes use pistachios and almonds too. Yummy dessert. Like the use of jaggery.